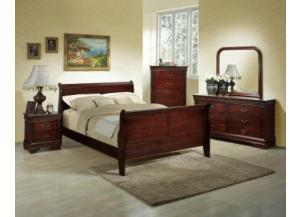 Bed: Slip away into sleep with this sophisticated sleigh bed. Curvaceous and shapely, this bed features a rich Cherry finish that instantly emanates a warm radiance with its presence. Subtle paneling on the head and footboard lend just the right touch of decorative detail to visually appeal, and arched end posts further the shapely, sweeping feel of the bed. Perfect for those looking to fashion a sophisticated, traditionally-styled bedroom, this sleigh bed offers just the right combination of little details and dramatic design to dress up your home. 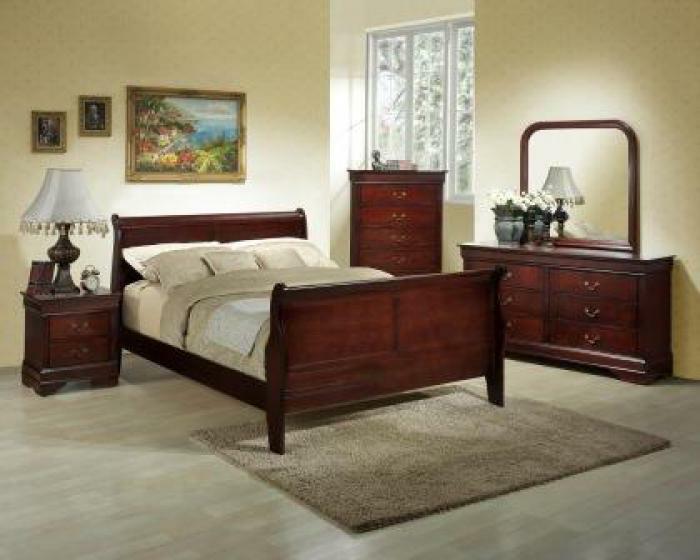 Dresser and Mirror: Dress up your bedroom and master suite with this six drawer dresser and mirror combo. Rectangular in shape with a classic, traditional design, this dresser offers ample space for tucking away clothing and apparel items. With simple moldings and subtle detailing in the woodwork, this piece is elegant and refined for a classy addition to your home. Drawer fronts are decorated with beautiful pulls that lend a visual element to the dresser that does not go easily unnoticed, and a spacious top offers the perfect place for home accents and decor, such as the accompanying dresser mirror. Featuring a beautiful wood frame, this mirror is square in shape with curved and rounded edges, giving it a look that is refreshingly innovative. Bring balance, equilibrium, and excellent storage space to your bedroom and uplift your home decor with this dresser and mirror set.